Thank you for voting! The flyer above was your overwhelming choice for our promotional efforts. Thank you for voting on Facebook, for emailing your votes and pressing “like” on the flyer of your choice. Tiffany Beard– How did you start working with Liberated Muse and Khadijah Ali-Coleman? Lyn Artope– Khadijah went to school with my husband, and later they worked together at Morgan State University. This was when Khadijah and I were introduced. I always loved her energy and spirit. When she sent out an all call for the play, I was excited at the chance to support her art as well as explore my talents. 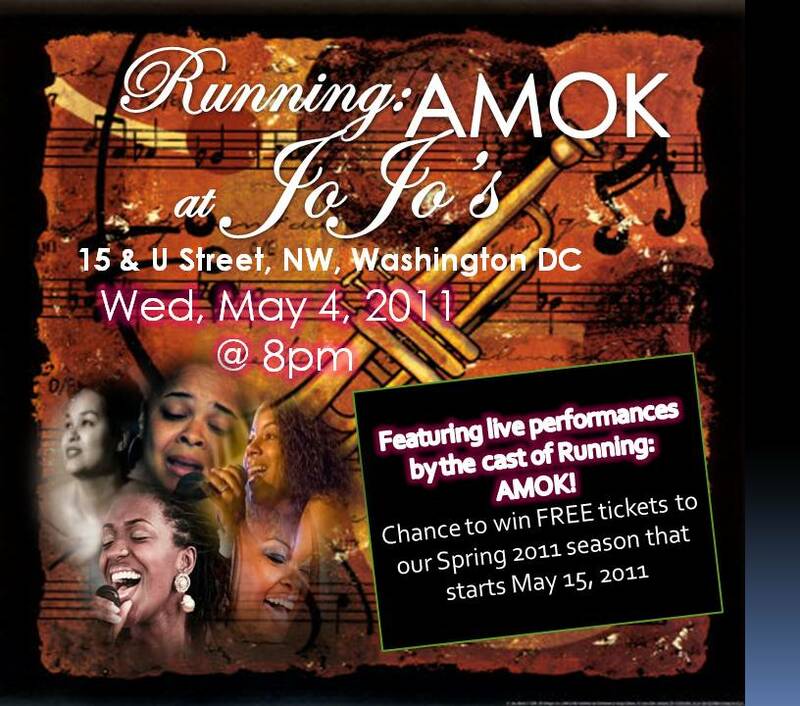 Running: AMOK is my first acting endeavor. T– Wow! That is a great connection! Is that how you got into her musical play Running: AMOK? LA– Unfortunately, I cannot sing and because I love the art I have denied the audience the privilege of discovering this fact for themselves. However, I must say that I have truly enjoyed working with my cast mates who have such phenomenal voices and range. As for the acting bug, I never considered myself to be an artistic person. I was a Psychology major and I worked in the mental health field before obtaining my Master’s in Industrial/Organizational Psychology. T– It’s a good thing you went to Khadijah’s auditions! It must be a definite break from the norm for you. LA– When Khadijah initially opened up auditions for the play, I was simply intrigued by it and I wanted an opportunity to explore a different side of myself. I loved the play, the subject matter, just acting in general. I was hooked and to make it better, I found I was actually good at it. T– That is an amazing thing to discover about yourself. Are you going to keep going in this artistic self discovery? LA– I always thought I lacked artistic capability. It turned out that I just hadn’t discovered my gift yet. I am very thankful to Khadijah and Running: AMOK, because it’s not everyday we get to learn something new about ourselves. ← Vote for the Show Flyer You Like Best!